With all the new colors and textures available, choosing wallpaper might just be the biggest part of your decorating job! First, consider how well your choice will stand up to the test of time. Choosing trendy colors and patterns is fun (and perfectly reasonable), just keep in mind that they will look dated in a few years. If you’re looking for a long-term solution, or if you might want to sell in the near future, it’s best to stick with classic patterns and neutral colors. Kitchen wallpaper needs to be durable, moisture-resistant, and scrubbable, because it will take a lot of abuse! Beyond that, anything goes. Kitchens are one area you can get away with bolder colors and wilder patterns. The trick is to use the wallpaper as an accent, rather than as the main attraction. Borders and backsplashes are a good way to add a bold pop to your kitchen decor. Cover one wall with mural of the Italian countryside to lend even more warmth to a Tuscan theme. You might also try cutting wallpaper panels to fit your kitchen cabinets. 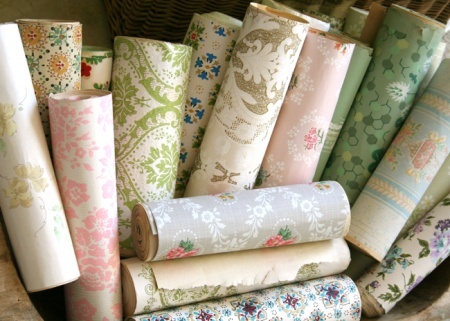 One popular version of wallpaper looks like punched tin- perfect for a country kitchen. In the bathroom, wallpaper’s resistance to moisture is critical. Try a subdued faux-finish to lend a spa-like ambience to the room. A heavily textured paintable wallpaper with curves and scrolls can be fun, too. Leave the paper white for the look of molded plaster, gild it for ornate appeal, or glaze it with a dark color (terra cotta, maybe?) and wipe away the excess for a time-worn finish. For bedrooms, wallpaper should contribute to feelings of rest and relaxation. Avoid high contrast prints and shocking color combinations. Damask, toile, or tone-on-tone geometrics will make the master suite feel like a luxury hotel. Natural materials such as grasscloth, when paired with the right accessories, can make a guest room feel like a beach house or a tropical oasis. When wallpapering kids’ rooms, remember that tastes change quickly. The Dora and Diego print your toddler is crazy for won’t be so appealing once school starts. Consider painting, then applying a border, decals, or even temporary wallpaper that’s easy to swap out as your child grows. Inspirational messages or your child’s name can be custom-ordered. Or choose a theme that’s not age-specific; a beach theme or Hollywood hotspot are fun ideas. Like bedrooms, living and work areas can handle more delicate papers. Flocking, fabric wallcoverings, and faux paneling are all great choices. Small patterns and light colors will make a room seem larger, whereas bigger patterns and dark or bright colors make spaces seem smaller. In offices (especially if you’re entertaining clients there) stick with neutral prints for a professional feel. If you’re lucky enough to have a dedicated game room, you can go crazy! A cityscape, funky pattern, or metallic finish will spice up your entertaining space.